(Horse-Nettle (Solanum carolinense) - 01) We spotted this small patch of horse nettle growing along the side of the road. 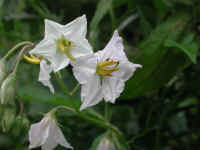 This wildflower is a member of the Nightshade family, which includes tomatoes and peppers. 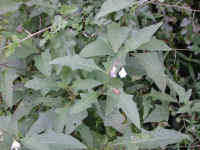 Horse nettles grow to heights of from one to two feet, and bloom from May through October. 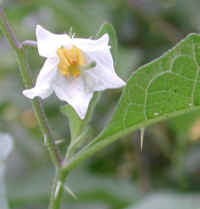 (Horse-Nettle (Solanum carolinense) - 01a) The horse nettle leaves, which grow alternately from the stem, are elliptical or oval with broadly toothed edges. 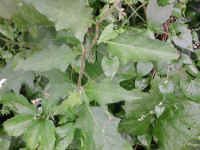 Both the stem and underside of the leaves have thorns or nettles. Several 3/4 inch (2 cm.) 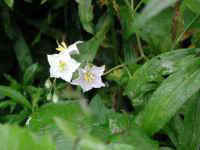 drooping flowers grow in a raceme. 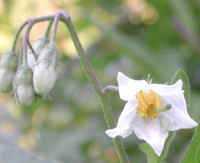 The flowers of the horse nettle are usually white, but may also be blue or lavender. (Horse-Nettle (Solanum carolinense) - 02) In this photo we get a close-up look at the very sharp thorns on the underside of a horse nettle leaf. 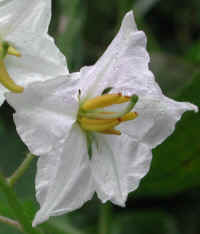 The plant parts of the horse nettle contain solanine, a violently toxic chemical. (Horse-Nettle (Solanum carolinense) - 02a) In this photo of the horse nettle, we can see an opened flower on one raceme and a cluster of buds on another. 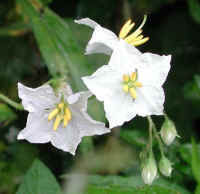 (Horse-Nettle (Solanum carolinense) - 02b) The horse nettle flower has five broad, pointed petals that form a somewhat star-shaped corolla. 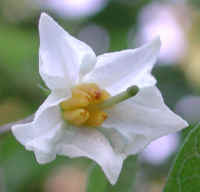 (Horse-Nettle (Solanum carolinense) - 03) The star-shape of this horse nettle flower is more pronounced, and the five thick stamens seem to have a "beak" shape. The thick pistil extends beyond the corolla and the stamens. 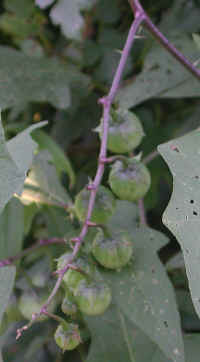 (Horse-Nettle (Solanum carolinense) - 04) The fruit of the horse nettle are these berries that look very much like grape tomatoes. When they are ripe, they turn orange. (Horse-Nettle (Solanum carolinense) - 05) This is a close-up look at some of the horse nettle berries. 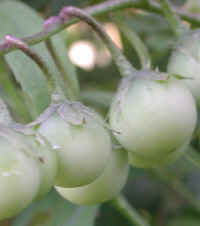 The berries contain less of the toxic chemical, solanine, than the rest of the plant, and as a result, herb doctors used the fried orange berries as a sedative and anti-spasmodic. 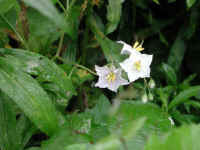 Unfortunately, before we had a chance to photograph the ripe berries, someone had trampled down the horse nettle. (Horse-Nettle (Solanum carolinense) - 06) In this close-up side view of the horse nettle flower, we can see the projection of the pistil and the beak-shaped stamens. 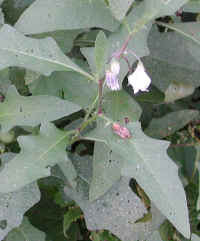 (Horse-Nettle (Solanum carolinense) - 07) In this photo we can see both mature horse-nettle flowers and flower buds. (Horse-Nettle (Solanum carolinense) - 07a) This is a closer look at the horse-nettle flowers and buds. 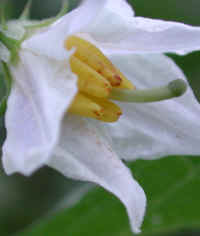 The stamens of the horse-nettle look like a bunch of tiny bananas, with the pistil projecting up from the center. (Horse-Nettle (Solanum carolinense) - 08) In this photo, we are looking downward at the stem and leaves of a horse-nettle growing with other plants along the side of the road. 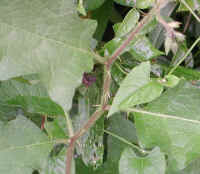 (Horse-Nettle (Solanum carolinense) - 08a) In this photo, we can see the 'jogging' of the main stem where the leaves branch off, and also the sharp thorns growing along the stem. (Horse-Nettle (Solanum carolinense) - 09) This is another look at some of the horse-nettle flowers and buds. (Horse-Nettle (Solanum carolinense) - 09a) This is a close up look at another one of the horse-nettle flowers. 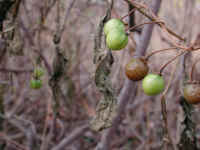 (Horse-Nettle (Solanum carolinense) - 10) We took this photo of the horse-nettle fruit in the Fall after the leaves had shriveled and died. (Horse-Nettle (Solanum carolinense) - 10a) This is a close up look at some of the ripe and unripe fruit of the horse-nettle. 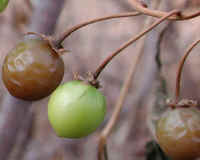 Since the leaves had already dried up, we do not know whether or not the unripe fruit will ripen. When we checked back a week later to check on the status, all the fruit was gone, so it remains a mystery.